We’ve made the ways you can tell Google exactly what you want more consistent by expanding the functionality of the quotation marks operator. In addition to using this operator to search for an exact phrase, you can now add quotation marks around a single word to tell Google to match that word precisely. So, if in the past you would have searched for [magazine +latina], you should now search for [magazine “latina”]. I am feeling Google removed the plus operator because of Google +, their social network. They do not want Google + confused with the operator, and now typing in + into Google + will auto complete with your friend’s names. I personally rarely used the plus operator, often using quotes instead. But I am personally sad to see it go. Postscript From Danny Sullivan: I can’t believe Google has done this. I use the + command all the time, especially in an age when more and more, Google constantly reshapes a search based on what it guesses a searcher wants, rather than what they entered. You can see that searching for [+1] causes a warning to appear, that you’re now searching for just 1. In this particular case, it makes no difference — Google has gained so much anchor text with the number 1 in it that it’s managed to rank well just for that number. But in other cases, you might be seeking more specific content about +1 but not finding it, because +1 was just doing a search for the number 1. That’s why shifting to searches for “+1” makes sense — though it’s a change being made almost certainly solely for Google’s benefit. It also perhaps poses a problem for people who are searching within Google+ itself, where people are commonly referred to by using a + symbol in front of their names. Imagine people learned how to symbolize addition by using the + symbol, then 150 years later, one of the big calculator makers declared that the + symbol would now be replaced by using the ” symbol. That’s what Google has effectively done, no big blog post, no notice, just yanked the command search engines have used for over a decade. And probably because it named its social network Google+ — making it hard to find. 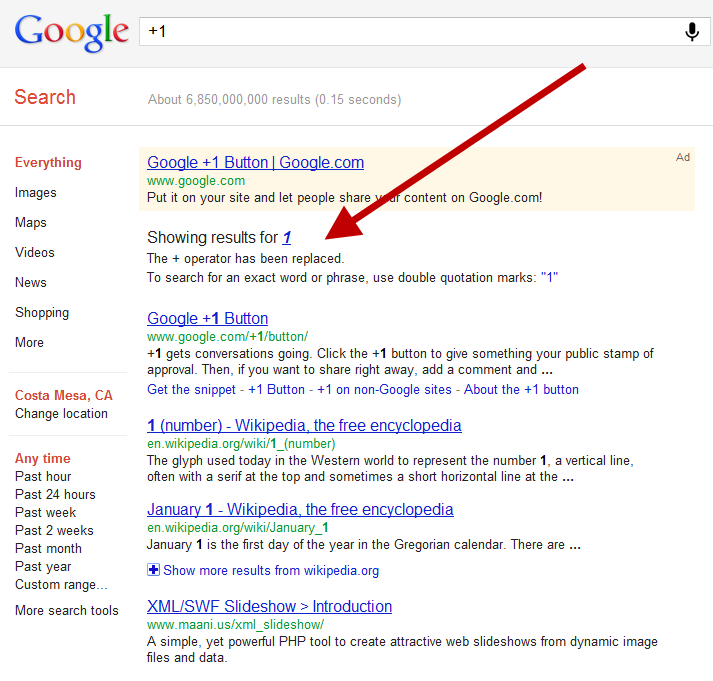 The plus symbol was used by web search engines before Google started. It’s been widely taught, and it seems to have been tossed out and replaced by quotes because of a problem Google created for itself, by picking stupid names for its social network. We’re streamlining the ways you can tell Google to search for the exact keywords you type, whether it’s an exact phrase or a single word, by focusing on the functionality of the quotation marks operator. So, if in the past you would have searched for [magazine +latina], you should now search for [magazine “latina”] to get the same results.